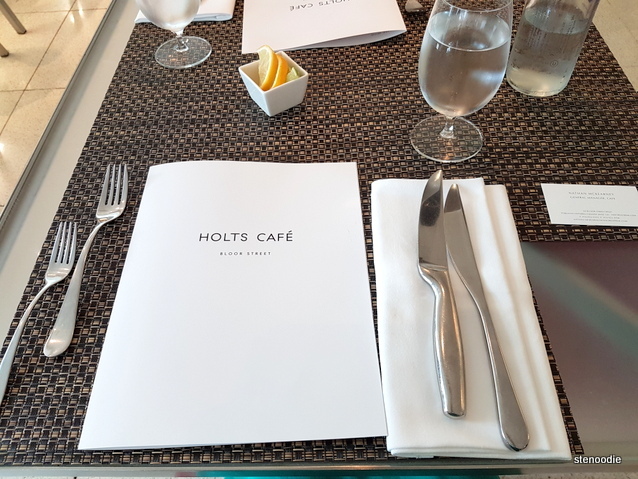 Yesterday, I had the pleasure of visiting Holt’s Café for a private tasting with my friend to try out items from their brand new menu. 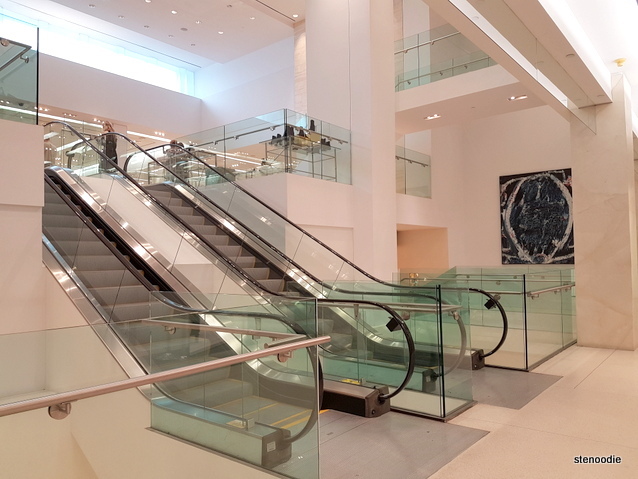 Holt’s Café is located inside Holt Renfrew, the “chain of high-end Canadian department stores specializing in an array of luxury brands and designer boutiques”. 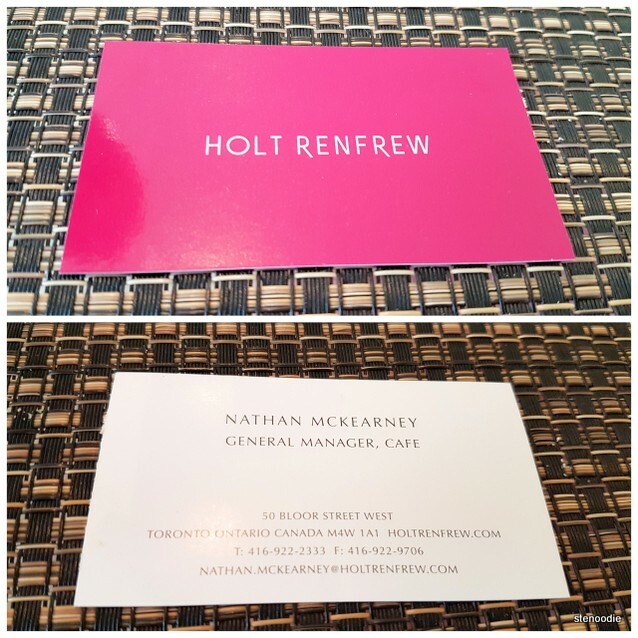 Tally from Food Services of Holt Renfrew was the one who invited me and took care of the reservation for our visit. 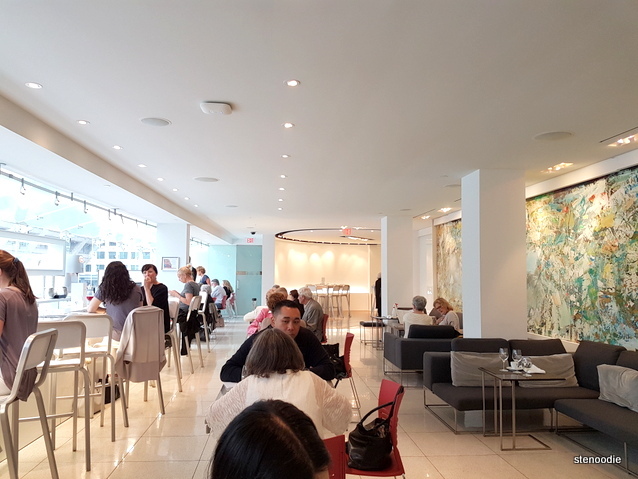 We were there around 1:30 p.m. on a Friday afternoon (our reservation was at 1 p.m. but traffic caused my friend to run behind) and I was really surprised to see so many people dining at the café! 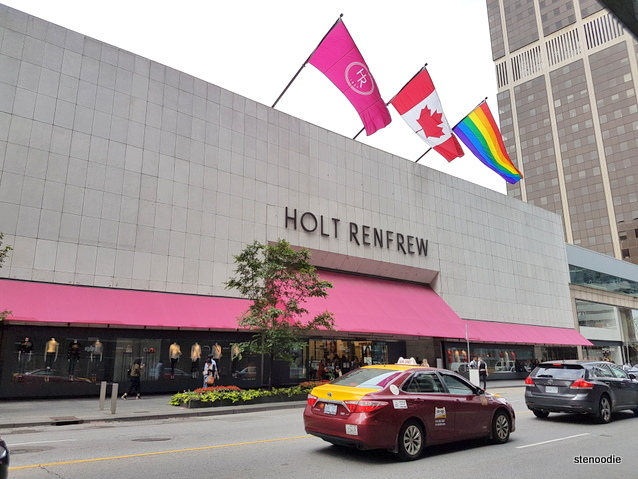 Being in Holt Renfrew itself is a luxurious experience since there are so many luxury brands and designer labels that make you feel like you’ve entered a high-end haven. Being in the Holt Café was no different. 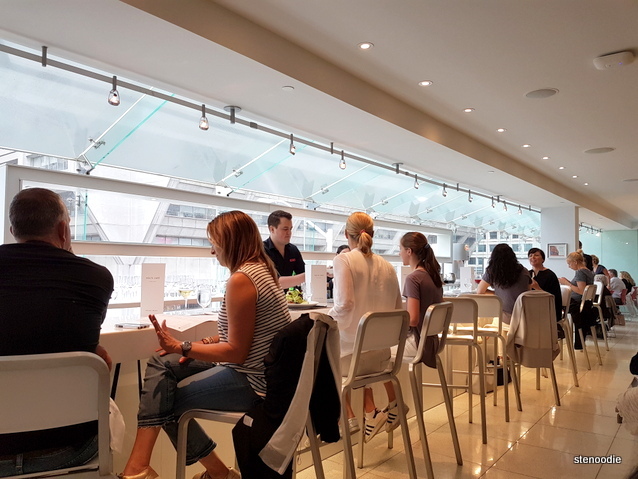 I felt like a treasured guest dining in their café as the service from beginning to end was top notch. At the hostess table, I informed the host about my presence and asked for Nathan. We were promptly served by another gentleman who took us to our table. As we were led to our reserved table, our chairs were pulled out for us and then our server, Max, came by and introduced himself to us. Nathan, the General Manager for the café also came out to shake our hands and greet us. It was a definitely welcoming experience. 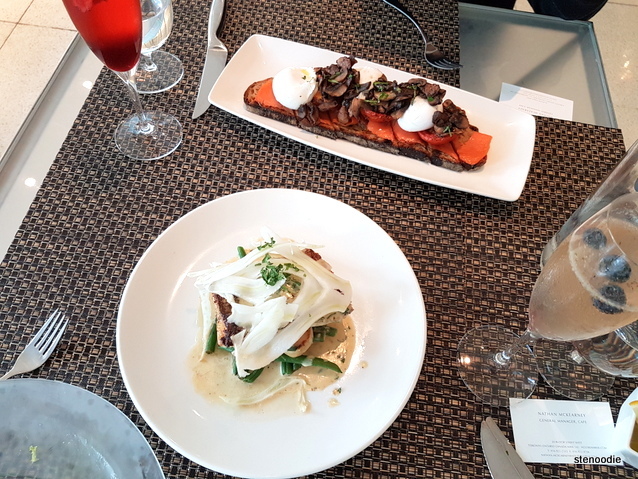 I was really excited about this tasting particularly because I love private tastings so that I’m able to thoroughly enjoy the tasting process and experience of being in the restaurant as an honoured guest. Max provided us with some sparkling water to start. 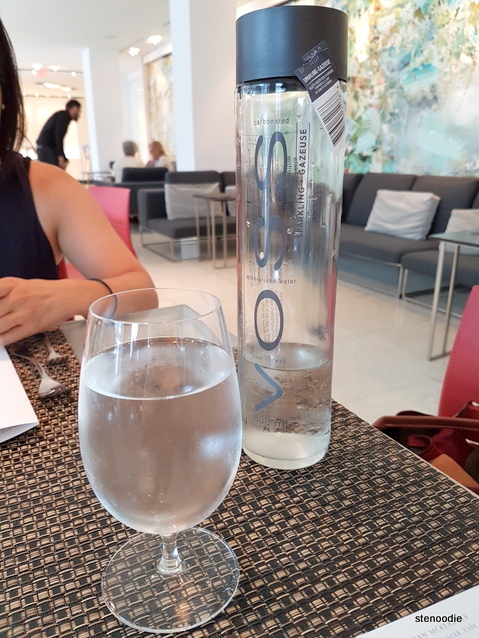 The sparkling water was poured from a freshly opened bottle straight from Norway. Priscilla and I started with the Holts Cocktails (and of course shared the drinks and everything else we got that day so that we would both be able to try everything together). The Renfrew was made with Smirnoff Double Black vodka, balsamic, strawberries, and champagne. 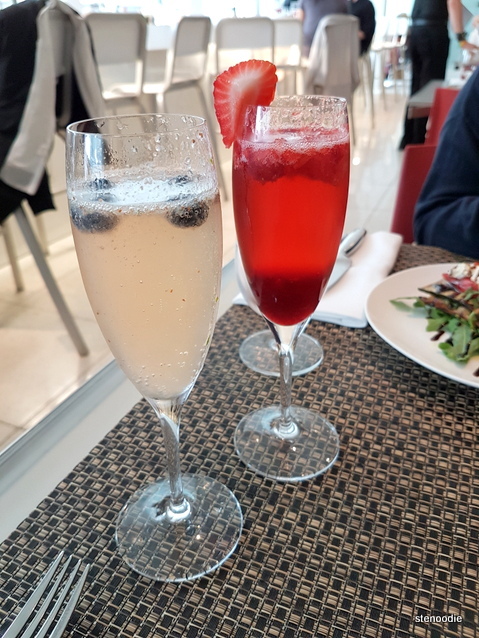 This was a bright red cocktail with a strawberry on the edge of the champagne glass. This tasted really delicious, slightly sweet, and definitely strong of vodka and champagne. I noticed a lot of other ladies ordered this lovely cocktail as well! The Blueberry Fizz was made with blueberry vodka, blueberries, mint, and champagne. For this one, there were several blueberries floating in the champagne glass with the “fizz” part of the cocktail very apparent when you took a sip. The mint was also detectable too. This was a lighter cocktail in taste than The Renfrew. 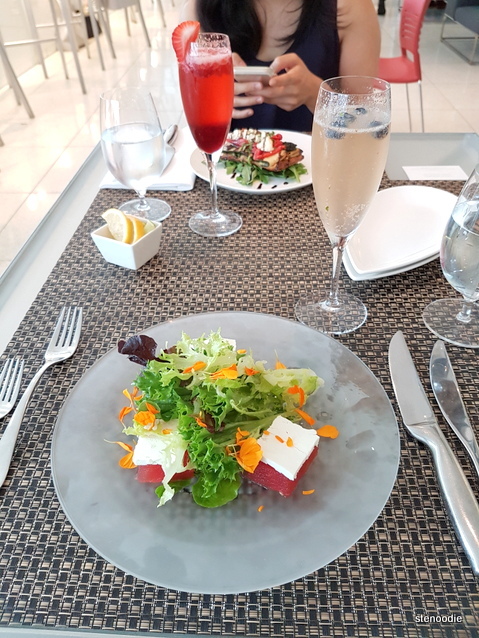 Our second starter was the Compressed Watermelon & Feta Salad. (We were actually contemplating ordering the Grilled Jerk Shrimp or Fragrant Steamed Mussels.) In any case, this second starter had an artisanal lettuce bouquet, basil, mint, edible flowers, aged balsamic drizzle, and olive oil. The ingredients in this were also very fresh and high-quality. It looked so beautiful and colourful too. The edible flowers were delicate orange petals that actually didn’t have a detectable flavour at all. 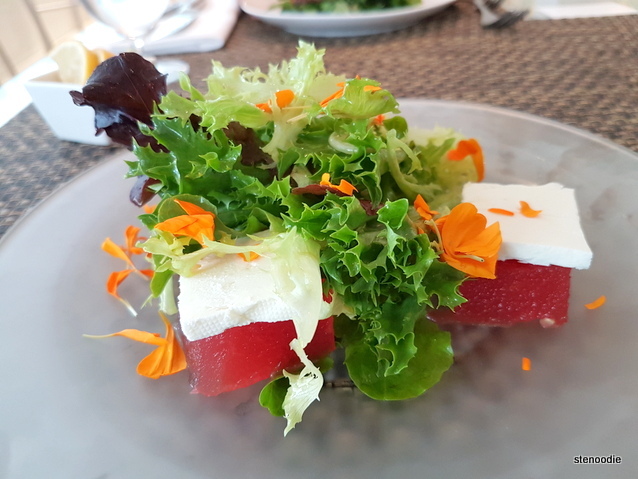 The cutest part of this salad was the cubed watermelon that was topped with feta cheese. Priscilla and I both thought this combination of sweet juicy watermelon paired with feta was an interesting one. When you have the juicy watermelon paired with the feta, it makes the feta taste differently than when you eat the two separately. The Pickerel was paired with creamy Jerusalem artichoke, French beans, and shaved fennel. This was another beautifully presented dish that looked like fine dining food. 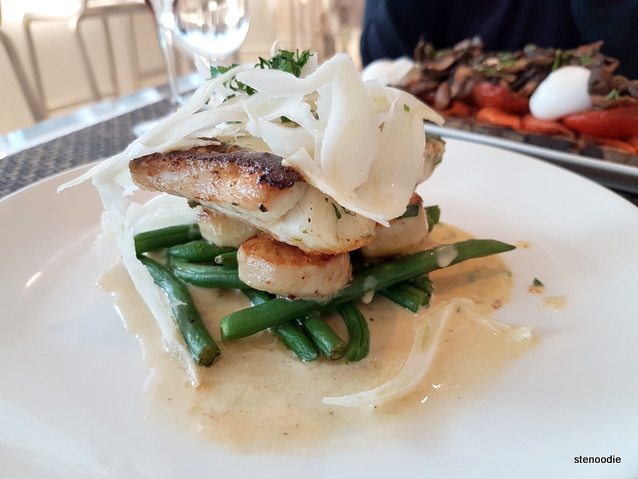 The piece of pickerel was topped with the shaved slices of fennel and sat on top of the French beans and artichoke. We also liked the French beans (so fresh and crunchy) and I liked the shaved fennel. The creamy Jerusalem artichoke was wonderful too and I wish I had a spoon on the side to scoop more of it up to go with each bite. The Tartines piqued my interest (Max told us that these were open-faced sandwiches). 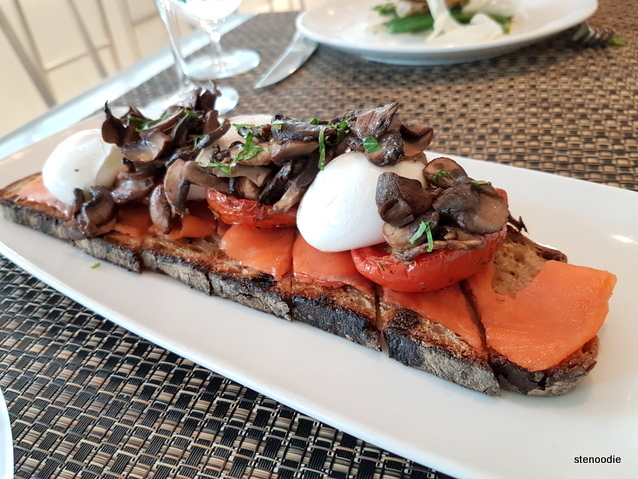 Thus, we ordered the Brunch Tartine to try. 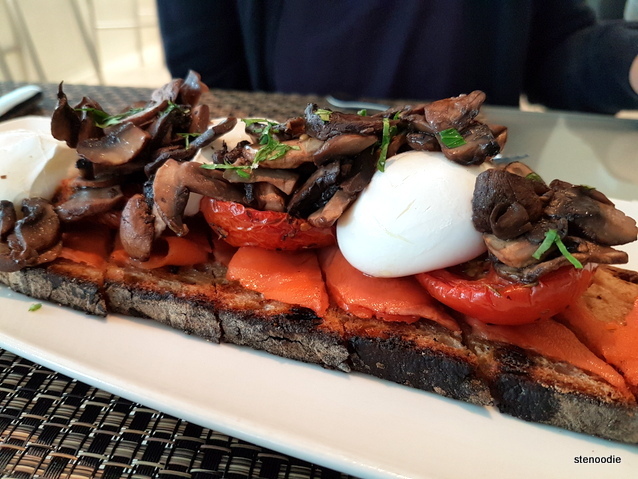 This included three poached eggs, coho smoked salmon, roasted mushrooms, oven-roasted tomato, and basil cress. Since both mains were already at our table and I was still finishing off the rest of my watermelon & feta salad, this Brunch Tartine was actually left on the table for a while before I finally got to it (I ate the Pickerel dish first since fish should always be eaten hot from the kitchen). Due to this, what I tasted of the Brunch Tartine might not have been what the kitchen and chefs intended it to taste. I say these because I thought that the smoked salmon was a little more cooked than I would have liked (perhaps it was left on the plate for so long that the roasted ingredients around it heated up the smoked salmon slices because when it first arrived to our table, the slices of smoked salmon looked less cooked). The sides of the open-faced sandwich were also a little bit burnt and dry. However, the poached eggs were done perfectly and when I used my knife to burst it it open, the yolk poured out beautifully. I liked the roasted mushrooms. Priscilla was in a rush to leave by 3 p.m. in order to make it to her work shift, so we quickly placed our dessert order with Max and we were thankful that the desserts arrived before Priscilla had to go. The Strawberry Shortcake was not your typical kind of shortcake in a cake form. Instead, it arrived in a cute dessert sandwich presentation. 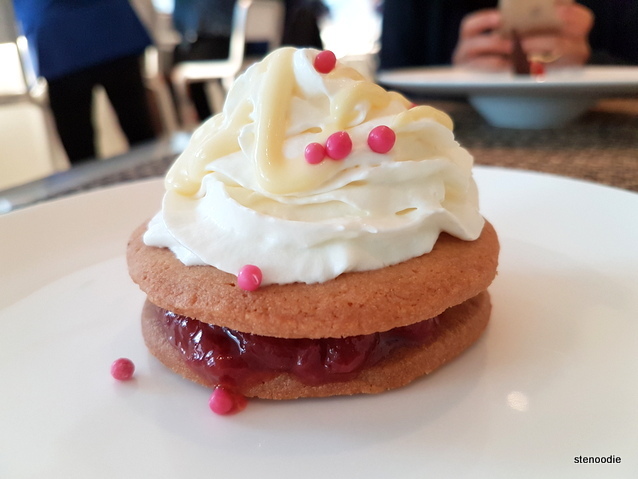 It was made with a shortcake biscuit, pastry cream, strawberry compote, crème Anglaise, and Chantilly cream. It was a really cute dessert! I found that this was a unique take on the traditional strawberry shortcake dessert. 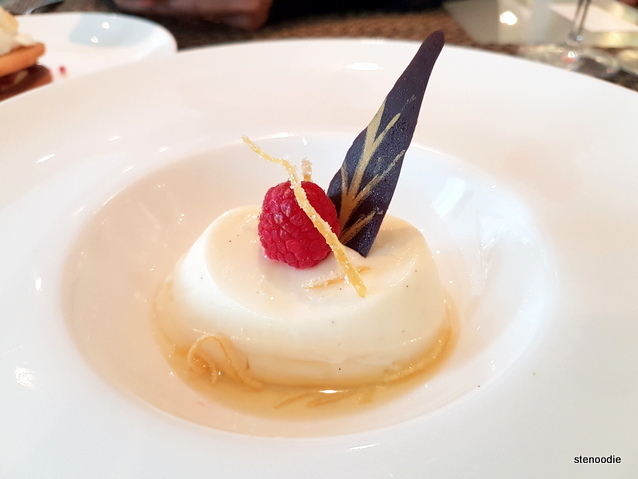 The Lemon Panna Cotta was vanilla lemon scented (it smelled so good), had fresh berries, a yellow leaf dark chocolate, and candied lemon. I really liked the look of this. 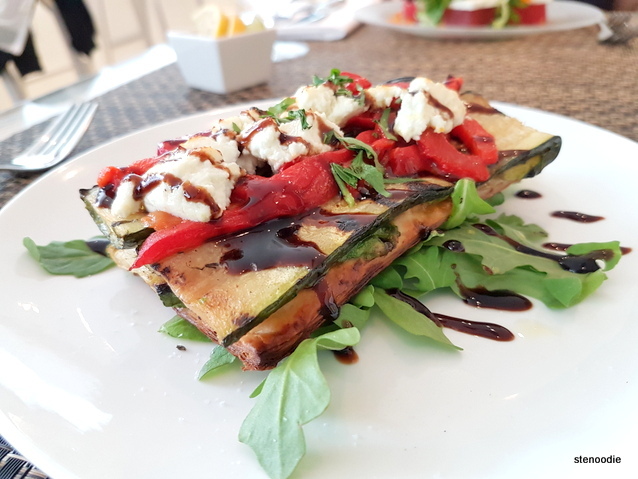 It was definitely belonging to a café of this caliber of food. I found that the vanilla lemon smelled so fresh and natural and I really liked the bits of candied lemon on the plate. 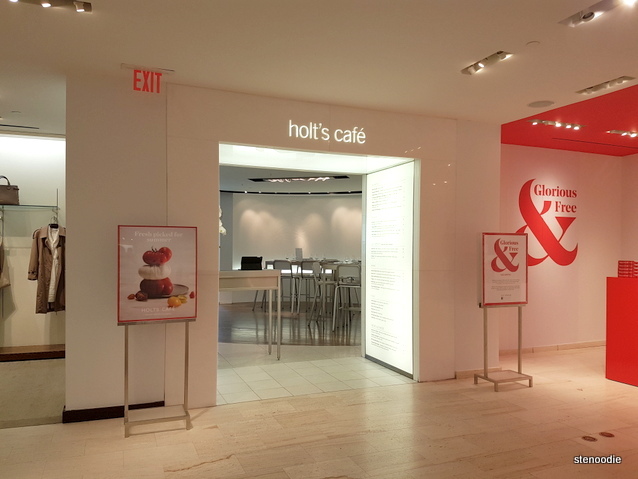 All in all, we had such a wonderful time tasting the new menu items at Holt’s Café. The service and attention to detail was exceptional and top notch. Max was an attentive, friendly, and professional server. The freshness and quality of all the ingredients were obvious in all of their dishes. 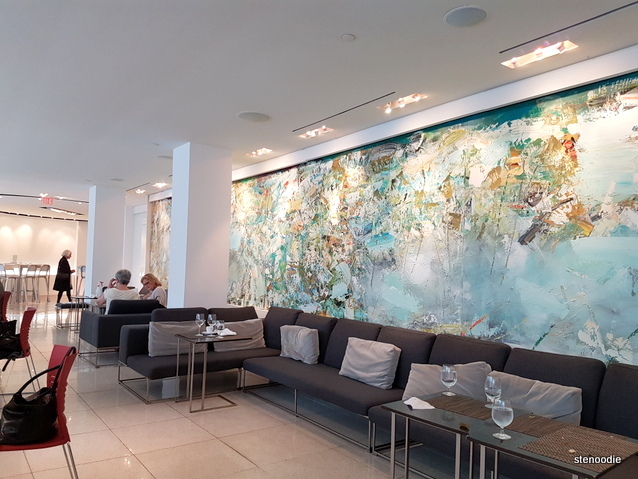 FTC Disclaimer: Although Holt Café reached out and invited me to a complimentary tasting to review their restaurant, the opinions expressed here represent my own and not those of the restaurant. This entry was posted in Complimentary Adventures, Food and tagged 50 Bloor Street West, @HoltRenfrew twitter, Blueberry Fizz, Brunch Tartine, Compressed Watermelon & Feta Salad, food blog, foodie, Grilled Summer Tart, Holt Renfrew Centre, Holt Renfrew lunch, Holt's Café entrance, Holt’s Café, Lemon Panna Cotta, pickerel, restaurant review, Strawberry Shortcake, The Renfrew cocktail, Toronto. Bookmark the permalink.